Wonderful hiking trails can be found in Joshua Tree National Park, and many are accessed directly from 29 Palms. 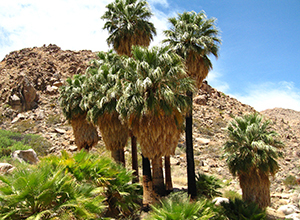 One such wonder is the 49 Palms Oasis, featuring a large stand of California fan palms (Washingtonia filifera) that provide a canopy of shade under which to rest amid the boulders and water ponds. To get there from the west end of 29 Palms, turn south off 29 Palms Hwy (Hwy 62) on Canyon Road and drive a short distance to the trailhead. Located on the northern border of the park, 49 Palms Oasis can be reached via a 1.5 mile (2.4 km) trail. The hike is 3 miles round trip with about 300 feet (91 m) of elevation gain in both directions, as you hike up and over a ridge dotted with barrel cactus. Beyond the ridge, you descend to a fan palm oasis in a rocky canyon. 49 Palm Oasis is a naturally occurring oasis in Joshua Tree, one of several oases in the park, including the Oasis of Mara, Lost Palms Oasis, and Cottonwood Spring Oasis. In an otherwise hot and sparse environment, fan palm oases are a luxuriant gift of shade and solace. The verdant display requires a constant supply of water so oases often occur along fault lines, where uplifted layers of hard impermeable rock forces underground water to the surface. 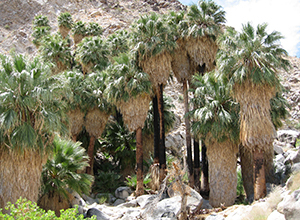 There are only 158 desert fan palm oases in North America. Five are located in Joshua Tree National Park. For more information, visit www.nps.gov/jotr/planyourvisit/hiking.htm. Water also draws animals to oases–bighorn sheep, Gambel’s quail, coyotes. Coyotes help spread palms by eating palm fruit at one location and depositing the undigested seeds at another. The cool shade of an oasis provides habitat for animals that live nowhere else. After dark, a rush of air may be caused by the passing of a western yellow bat, they roost only in palms. During the day, a flash of yellow-orange might be a hooded oriole preparing to build its woven sack-like nest under the large green leaves of a desert fan palm. Palms stand straight and tall, looking proud and invincible. But they aren’t. Any place can be over loved. As you explore these oases of wonder, take care. Use existing paths. Watch out for young palms-seedlings look like thick blades of grass. We do not want the presence of people to be a sign of a declining oasis. A word of caution: Avoid this trail when it’s hot. Park officials emphasize the importance of knowing personal abilities and limitations when hiking, especially during hot summer conditions. Understanding the demands of specific routes as well as having proper clothing and sufficient water are crucial elements of a safe hike. Also, when drought conditions persist, National Park Service staff will close 49 Palms Oasis temporarily to allow the bighorn sheep access to the remaining water in the oasis. Normally, they will not come to drink if visitors are present. Notifications will be posted midway along the trail if the oasis is under temporary closure.